In our latest report, the Office for Education Policy summarizes the 2014-15 assessment results for Northwest Arkansas districts and charter schools. 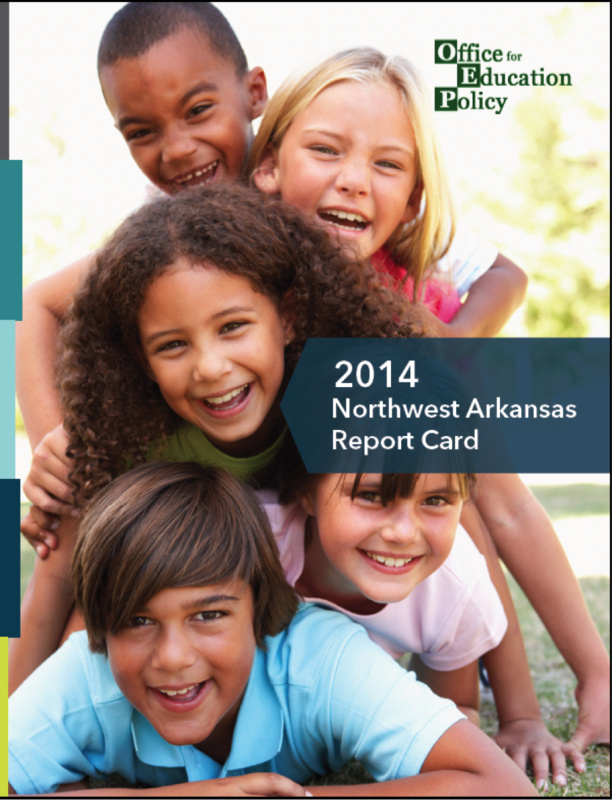 In partnership with the Northwest Arkansas Council, we are proud to release the 2015 Northwest Arkansas Report Card, our annual look into standardized test performance, graduation rates, and all things K-12 in our region. How are Northwest Arkansas Districts Doing? Northwest Arkansas districts outperformed the state on 2014-15 assessments and high school graduation rate. NWA districts spend less per pupil, enjoy more National Board Certified Teachers, and boast eight high schools ranked in the top 10% in the nation by U.S. News & World Report. In addition, data recently released by the Center for Education Policy Analysis at Stanford University, presents a new method for comparing the state assessment performance of Northwest Arkansas districts to other districts across the country. These data show that Rogers School District, despite serving a large population of students At-Risk outperforms 72% of other districts across the county. Fayetteville School District outperforms 77%, and Bentonville School District outperforms 84% of districts nationally. The Report Card presents a ‘district dashboard’ format that makes it easier for educators, school administrators, parents, and state lawmakers to see how regional school districts are performing. A change in the assessment administered in 2014-15 (to PARCC) resulted in a substantial decline in student performance statewide, but because the NWA Report Card compares districts to their peer group in the region (either the ‘Big 5’ districts or the ‘Small 10’ districts) we can still get a measure of how performance compares. Information includes key metrics about assessment results, graduation rates, student demographics, and financial indicators. Bentonville and Fayetteville were the highest performing traditional school districts on state assessments overall, and serve the lowest percentage of At Risk students. Gentry had the highest proficiency rates for At Risk students. Proficiency rates for students were higher than the “Small 10” average, even though Gentry serves a higher percentage of students receiving Free/Reduced Lunch and Limited English Proficiency services. Bentonville, Fayetteville and Prairie Grove were the highest performing traditional school districts on the Iowa Test of Basic Skills for students in grades 1 and 2. Elkins graduated 96% of seniors in 2014-15: the highest traditional school graduation rate. Charters are also performing well; Haas Hall reported near 100% proficiency and graduation rates, and no At Risk students. In addition to the ‘district dashboards’, we also included spotlights about programs that extend beyond the classroom. Athletics, arts, advanced coursework and academic challenges are all areas where students in NWA districts excel. Benchmarking against other districts regionally and nationally is a comparison districts should welcome. Making reasonable comparisons of student performance allows us to celebrate, and recognize that we can still do better. Northwest Arkansas offers many benefits to its residents, and outstanding public education for all students should be one of them. This spring, students in Northwest Arkansas and around the state completed ACT Aspire, another new assessment. Although the results of these assessments will not be directly comparable to the results presented here, they are the first step in a stable assessment system that can be easily used to measure changes in student performance across years. There is no single measure of successful education, but improvement in graduation rates, advanced coursework completion and fiscal efficiency along with improved performance on other state assessments is something all our NWA districts should strive for. For more information about current education issues, check out OEP’s Policy Briefs and Blog. The more we can share the good news and look for ways to improve, the better Arkansas and Northwest Arkansas will be. We invite you to share this report card with anyone who might be curious about the state of education in our region. If you want more information on schools in Northwest Arkansas or the state as a whole, head on over to our website, where you can dive into all of the publicly available data on school demographics, test scores, and finances.